6 WEEK CHALLENGE is here! This is an incredible opportunity to TRIM YOUR WAIST & STRENGTHEN YOUR CORE with the world's most advanced Fitness Hoop. For 10 years Powerhoop/Innertrak has been working very hard to create a workout that REALLY MAKES A DIFFERENCE and proven by science that it GIVES YOU RESULTS! Need proof? Check my testimonials on my website. I am inviting you to start your journey and let's transform your body while having fun at home and in Mr dod's classes. When you have registered I will give you the online access to the full training for FREE! Time to treat yourself and get that body ready for the summer holidays! Contact me if you have any questions & SPIN YOUR WAY TO A NEW YOU! You need to REGISTER to be able to access the ONLINE STORE so you can pick whatever package suits you best. 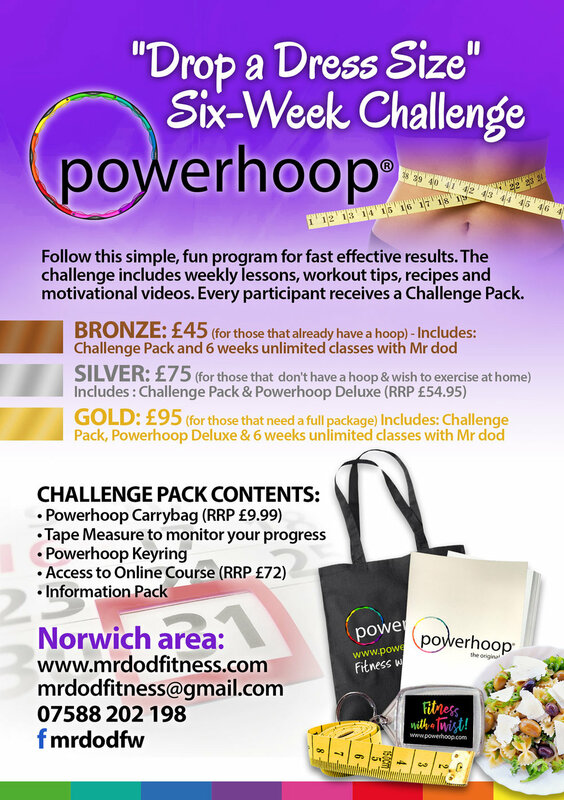 Your must be 16 or over to be accepted to do this 6 week challenge and please complete the health form when registering.